'Bride's Halo' ( Hubert C. Mohr, R. 1971). Seedling 68-14-2. TB, height 36" (91 cm), Early to midseason bloom. 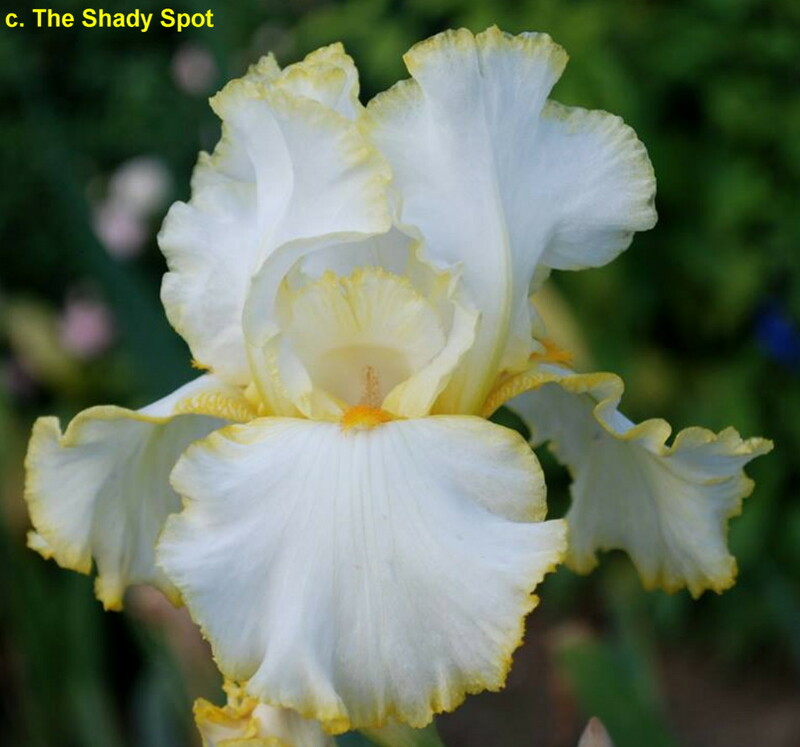 Heavily ruffled and lightly laced white (RHS 155C) bordered by 1/8" yellow (12B) band; yellow (17A) beard. 'Rainbow Gold' X 'Denver Mint'. Mohr Gardens 1973. Honorable Mention 1974; Award of Merit 1976; President's Cup 1977; American Dykes Medal 1978. From AIS Bulletin #209 April 1973 Introducing BRIDE'S HALO (Mohr '73). Sdlg. 68-14-2. TB. 36". EML. White self, bordered by one-eighth inch band of yellow. Heavily ruffled. Lightly laced. Yellow beard. Rainbow Gold X Denver Mint. $25.00. Mohr's Garden. jpg 20170601_140731TB Brides Halo (combo) .jpg manage 661 K 13 Aug 2017 - 02:51 HollyJohnson2017-04-01 2 views of a single bud of TB Brides Halo. Photo taken by Holly Johnson at the Minnesota Landscape Arboretum, zone 4b, on 6/01/2017. jpg 20170601_140827TB Brides Halo (2).jpg manage 1 MB 11 Aug 2017 - 14:52 HollyJohnson2017-04-01 TB Brides Halo. Photo taken by Holly Johnson at the Minnesota Landscape Arboretum, zone 4b, on 6/01/2017. jpg BHP_7264-X2_brides_halo.jpg manage 127 K 20 Feb 2016 - 23:09 BrockHeilman Please contact Brock Heilman for image use. JPG BRIDESHALO1.JPG manage 144 K 22 Nov 2018 - 20:41 Main.TLaurin Photo by Debbie Carpenter-Iris Splendor Garden-Australia. jpg BridesHalo (1).jpg manage 232 K 28 Dec 2018 - 23:05 Main.davepote AIS Bulletin 227(Fall 1977): back cover.